Come out and experience a live podcast at Sully's and meet the whole team! Come out to Sully's grab a drink (or 10) sit back and watch the shenanigans of our podcast Paco's Got Balls featuring Wendi! 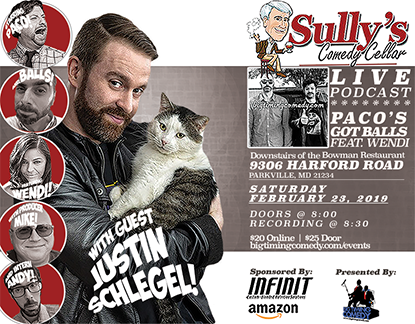 We will have our studio set up right on stage so you will be able to watch and engage with us as we record our podcast with super special guest Justin Schlegel of the Justin, Scott and Speigel Morning Show on Baltimore's 98Rock! You will be able to ask questions and engage with the show as its happening! You will also get to experience Justin broadcasting uncensored as this show IS 100% uncensored!